Thanks to everyone for all of the wonderful introductions leading up to this first official Make Cycle 1! It’s always nice to meet and greet everyone, from those who have done CLMOOC before to those who are just entering the CLMOOC atmosphere. Last year, we wrote this bit in our first newsletter and it still holds true. Some of you will lurk and learn on your own, watching from the shore; others will dive in everywhere, mixing conversations and creations. CLMOOC participants are welcome to participate in any way on that continuum — What follows are the first suggestions that might get you started on what promises to be a playful and powerful learning experience. You’ll see opportunities to dip into this collaborative pool if your learning time is fleeting, or ways to dive in if you’ve carved out space to make and learn in community. You’ll notice we’ve rearranged our metaphors this summer, shifting from the Dip/Swim/Dive to a Pencil/Ink/Paint. There are art-themed ideas floating around this summer. Ignore the metaphorical categories of Pencil/Ink/Paint if they don’t work for you. Our aim is to provide a few entry points. Remember: the center of CLMOOC is always you! And now … Make Cycle 1: Collaborative Coloring Book! When I was a kid, before I knew I was color blind, I enjoyed the small boxes of Crayola™ crayons with bright red, vibrant blue, glorious yellow and verdant green sticks of colored wax. Coloring books for kids are common and have recently become popular with adults. This Make Cycle is designed to give you the chance to get in touch with your “inner child” and to perhaps go a step further. Of course, you can simply print copies of the distributed colorable pages to color on your own. As always, though, a big chunk of the fun comes with offering up your own work to share with the rest of the CLMOOC community. Through the summer of 2017 and maybe far beyond, you can design pages for others to print and joyfully color. Create a design which offers participants the chance to choose a crayon, or an acrylic-dunked brush, whatever. The designs you make will provide hours of happy childlike coloring fun. Each person submitting a page for others to color should know that it will be licensed Creative Commons Attribution 4.0 (CC-BY) which means that others can reuse your work in any way as long as they give you credit. Garish colors or harmonious blends are all very welcome. 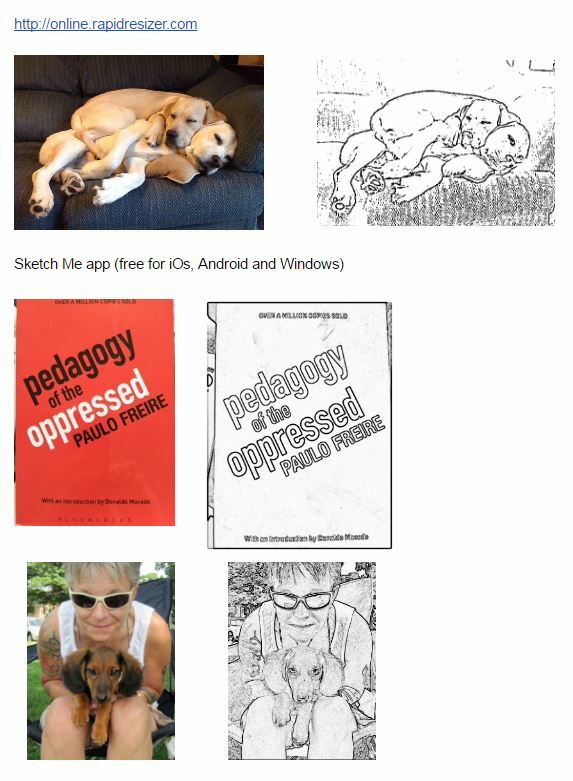 We hope to make a compilation of all the submitted pages by the start of September so you can get back to school (lots of CLMOOC folk are educators.) Let’s set our preliminary submission date as September 1. And, yes, you can let your students have some fun too. Pass out the colorable pages for them to work on. Along the way, we would love it if you shared your methods. Here is how I created the tufted titmouse image with software called Inkscape. Maybe you might want to try it too? Here are some possibilities for this Make Cycle. Of course, feel free to chart your own path forward. Color outside the lines. We encourage that. Use paper or use some digital device, and create your own blank coloring page (minus the color) for the CLMOOC Coloring Book Project. It could be as simple as lines crisscrossing on the page to make mandala-like designs or something more complicated. Send a copy of your coloring page individually to someone (or someones) on the CLMOOC postcard project mailing list. (Just so you know, you have to be part of the mailing list in order to see others’ addresses.) This is “art in the mail” and forges a closer connection. Find someone else’s shared coloring page and “get your art out” on it, and then be sure to share it back to the original maker. Remix, as needed. Add a video entry to our CLMOOC FlipGrid exploring color…and/or respond to someone else’s FlipGrid post! Since we’re hoping to pull all of our coloring pages into a shareable CLMOOC Coloring Book, we are going to set a deadline for submissions. Please have your coloring page submitted by September 1 and you can submit it by using this Google Presentation. Grab a page in the presentation or copy a blank page to work on your own first, and upload your uncolored page for others to download here. Then, in an act of reciprocity, we ask you to download someone else’s uncolored page and color away. We’re not done yet. Next, upload one you’ve received and colored here. We’ll ideally end up with two books: a collection of uncolored art (ready to be colored) and a collection of art that has already been colored. We also encourage you to share your work in the CLMOOC Make Bank. Join our Make With Me live broadcast with chat on Tuesday, July 11, at 1pm ET/10am PT/5pm UTC live streamed with a synchronous chat here at CLMOOC. This session will also be recorded so you can watch the archive later. In an attempt to address more time zones, we will be hosting two Twitter chats for Make Cycle #1 — Thursday, July 13 at 1pm ET/10am PT/5pm UTC AND at 7p ET/4p PT/11pm UTC with the #clmooc hashtag. Have fun and have some conversations with participants about commonalities, surprises, how-to questions, etc. Our CLMOOC G+ community is bursting with color, conversation, and connections. Lurk around a while to catch the wave of connected learning, or launch right into conversations and creations. Be yourself; we — the community — are here to support each other as connected learners. Thank you for Coloring the World with us!